I went to a Blog- Jam hosted by Preethi. Preethi introduced their Iconic Table Top Wet Grinder. The Iconic Table Top Wet Grinder simulates traditional stone (Attukkallu) grinding process so that you get exactly the same quality of Idlis our elders used to make. Preethi also showcased their Turbo Chop Kitchen Appliance. Kitchen Appliances too evolve with the times and needs of the people. Today's families are mostly nuclear family with two kids or just one kid, Double Income No Kids families etc. In Today's households, Ladies are also harried whether they are housewives or working women. Hence the quality time for cooking is shrinking year by year. To address this need of families, today Innovative food companies are coming up with ready-mixes for every main dish from idli, dosa to rasam etc. The next important step to simplify regular cooking is simplifying making side-dishes. 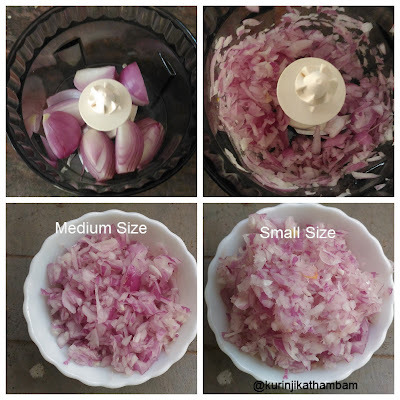 Indian (and South Indian in specific) Side dishes like chutneys and pooriyals have to prepared fresh and cannot be pre-packaged like tomato-sauces of the west. In today's regular cooking, the chopping of vegetables for these side dishes is the most time-taking and laborious activity. Though some enterprising entrepreneurs have come up with chopped vegetables packed in special sealed packages, either they are very costly or not fresh. There is also a worry about added preservatives. There are some very important drawbacks in current mixie models in the model. For example, it is not very easy to clean as removing blades from earlier mixie models is difficult and fungus would form if we do not clean it properly. Also, older appliances like mixies, grinders are not suited for cooking for just one, two or three people only. Preethi Turbo Chop is an innovative combination of Chopper and Mini-Mixie. You can chop the ingredients in the jar through a simple-to-use push button on the top. You have to just keep pressing till you want to chop and remove when you are done. It is very safe that even kids can do it. Turbo Chop is ideal for preparing all types of chutneys, purees and chopped vegetables for poriyal ie all key side dishes of regular cooking today. Turbo Chop can also be used to prepare all types of poodi items for monthly or long term use. It can also used for crushing nuts and preparing ingredients for festival sweets. As Turbo Chop is very less weight, you can easily carry it while travelling also. For example, you can take it to hospitals to prepare juices. Similarly, you can take even during tours and travels to prepare chutneys, juices on the fly and avoid hotel foods. 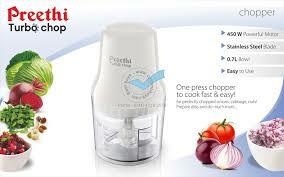 Preethi Turbo Chop is digital kitchen Swiss-army knife in the kitchen. With Preethi Turbo Chop you have a very well researched innovation that addresses the need of today's women of all segments - always on the run Working women in IT and other Industries, cost-conscious housewives, college-goers, bachelors, elderly people etc. 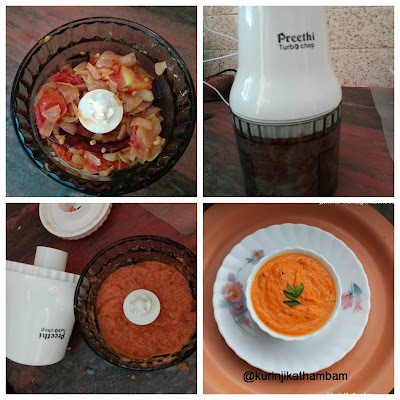 Preethi Turbo Chop is just the type of innovation that solves a nagging -issue in cooking instead of meaningless marketing gimmick innovations which flood that market all the time. 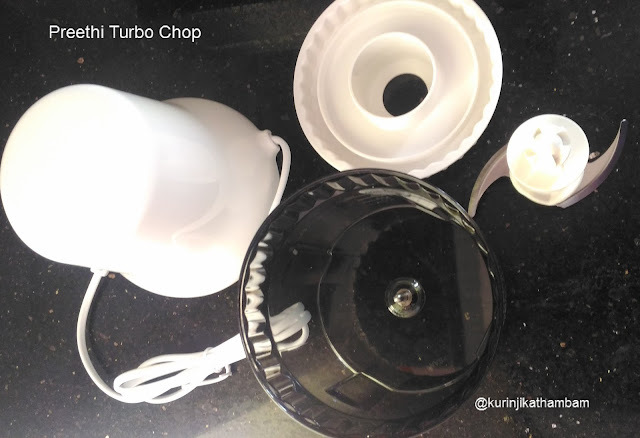 Kudos to Preethi for coming up with Turbo Chop. Turbo Chop Mini Mixer-Grinder is a 450W compact kitchen appliance with laser sharp blades that can grind, mix, chop, and blend within seconds. This Mini Mixie is, therefore, the perfect kitchen companion. Unlike other Blogger-Meets, Preethi arranged for two great talks, one by Archana of ArchanaKitchen.com on how to take our blogs to the next level. The other talk was on improving food photography skills by Chef.Umasankar Dhanapal, Winner of IKA / Culinary Olympics (http://www.knifeandimpressions.com/). Both the speakers gave very good tips for improving our blogging and photography capabilities. Festival Season has already started. Easy to make sweet recipes are in demand for both beginners making their first sweet and well-versed people planning their additional sweet. Maalaadu is a simple sweet but it is not liked by many because it is sticky. 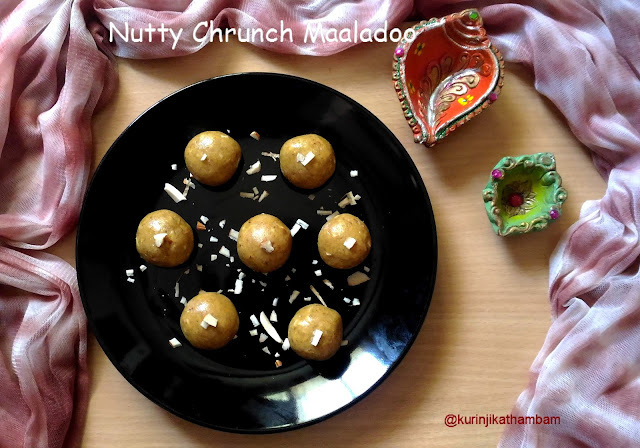 Nutty Crunch Maaladu is a variant of Maalaadu which makes it non-sticky and crunchy so that kids and adults also would relish it. 1. Dry roast the roasted-gram (pottukadalai) till they become hot. Don’t over roast it. Keep it aside. 2. Dry roast the badam for 2 mins or till they become hot. 3. Grind the roasted gram into fine powder without any lumps using the dry mixie jar. Keep it aside. 4. 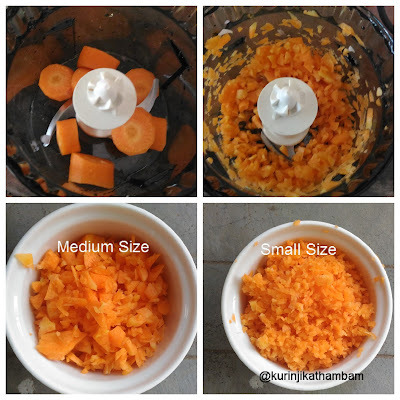 Grind the badam into small granules. Don’t grind them into fine powder. 5. Chop the cashew nuts into small pieces. 6. Heat one tbsp of ghee in a pan. Fry the chopped cashew nuts till they turn into brown in color. Switch off the flame. 7. Grind the white sugar and brown sugar into a fine powder using the same jar separately. 7. In a wide bowl, add powdered roasted gram, badam granules, powdered sugar, and powdered brown sugar, roasted cashew nuts with ghee and cardamom powder. Mix them gently with ladle or with your fingers. 8. Now heat the remaining ghee in a pan, add the hot ghee little by little in the above mixture. 9. Mix them immediately with the ladle. When you can hold the mixture to make balls, stop to adding ghee. 10. Grease your hand with oil and immediately make gooseberry size balls from the mixture and keep it aside. Allow it to cool down completely. Now nutty and crunchy Maladoo is ready to serve! 1. Roasting badam and roasted-gram (pottukadalai) is optional. 2. You can microwave them for 2 mins instead of roasting. 3. 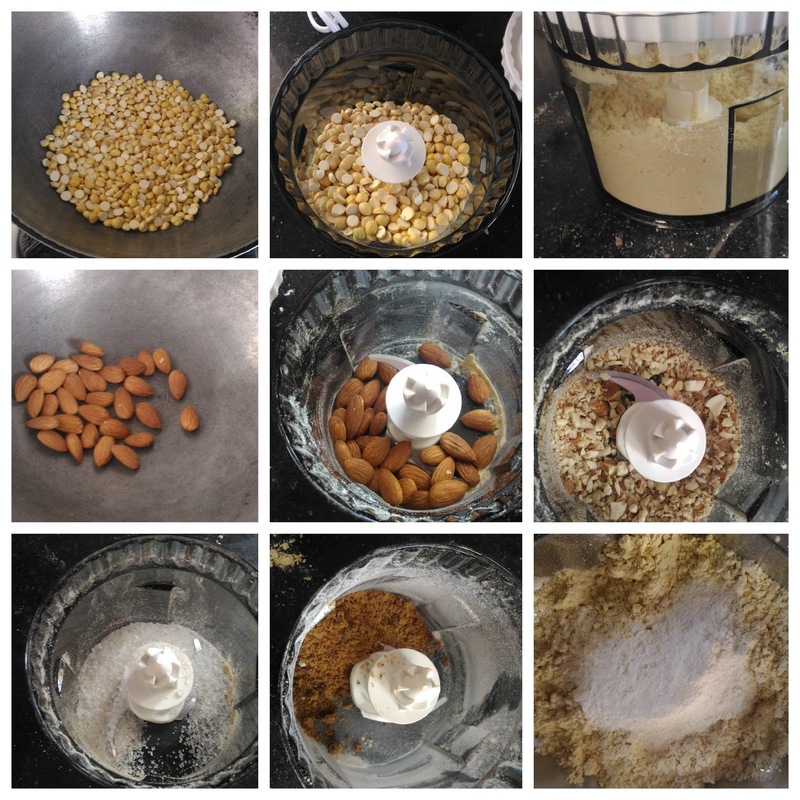 You can grind the badam into fine powder also. 4. The given amount of ghee is enough for this recipe. You can add if you needed. 5. 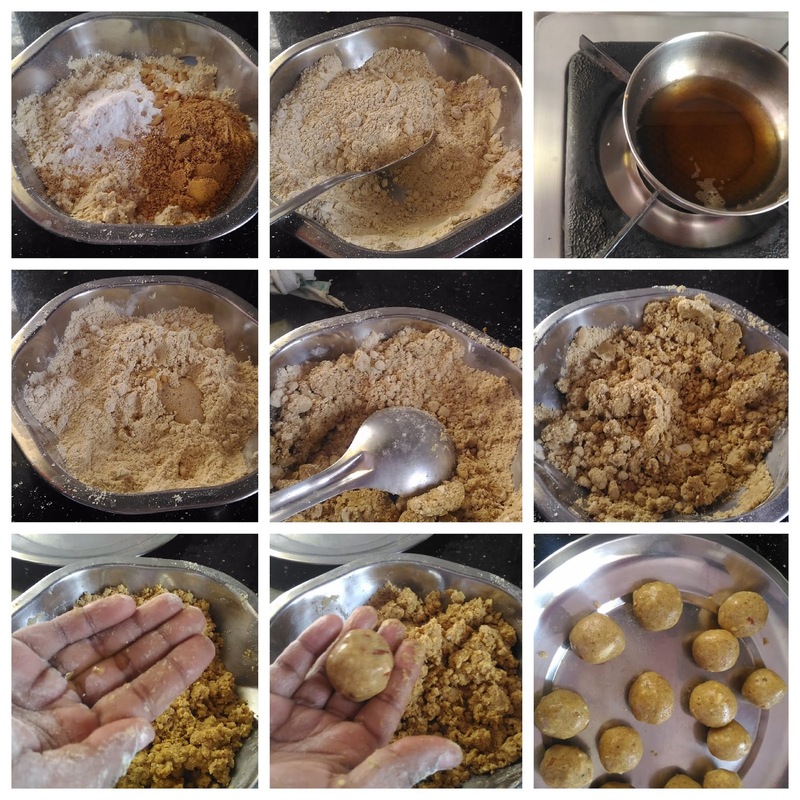 If you find that the ghee is more add more powdered roasted-gram (pottukadalai). 6. Adjust the sugar level according to your taste. 7. You can use ½ cup of white sugar or ½ cup of brown sugar instead of 50-50.